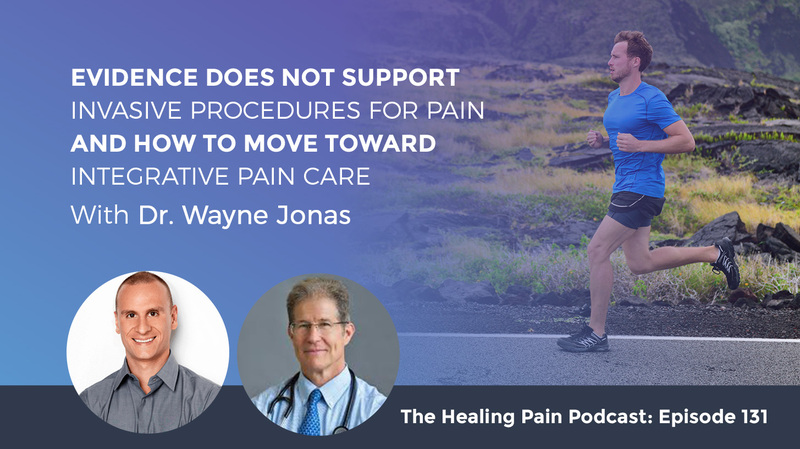 On this episode, we are discussing the insufficient evidence for invasive procedures and chronic pain in how we can move our sick care system toward an integrative model of pain care. Joining us is Dr. Wayne Jonas. He is a practicing family physician, an expert in integrative health and a widely published scientific investigator. He served as the Director of Alternative Medicine at the National Institutes of Health and was the Director of the World Health Organization’s Center for Traditional Medicine. He published a book called How Healing Works and in September of 2018, he published a systematic review and meta-analysis called Are Invasive Procedures Effective for Chronic Pain? Make sure to download this free gift called a Guide to Nutrition for Chronic Pain. To receive the Guide to Nutrition for Chronic Pain, all you have to do is text the word 131 Download to the number 44222 or if you’re on your computer, you can open up a browser and type in the URL www.integrativepainscienceinstitute.com/131Download and you’ll receive instant access to this free gift. If you are a practitioner interested in learning more about nutrition for chronic pain, make sure to check out the certification program offered through the Integrative Pain Science Institute called Functional Nutrition for Chronic Pain. You can learn more by visiting www.IntegrativePainScienceInstitute.com and then you can click on the courses tab. It’s fully accredited for 36 PT CEUs. Let’s begin with Dr. Wayne Jonas. Dr. Jonas, welcome to show. It’s great to have you here. Thank you, Joe. It’s great to be here too. Thank you for having me. I know you have a lot of great things going on in the world of integrative medicine where you’re helping both practitioners and patients and opening up their eyes to some of the wonderful things that integrative medicine can offer a patient with regard to pain relief and healing from other chronic diseases. Can you tell us how a family medicine practitioner became interested and involved in integrative medicine? I’m a family doctor, conventionally trained and I was in the military for 24 years. During that time, I was running a hospital over in Germany. I was assigned to take care of a group in a remote area of Germany. The German physicians did all of our emergency transport, emergency care because we were so far out in the boonies. I worked with them. I had lived in Germany as a kid and spoke German and we organized all of that. I went out to the local German medical meetings to meet them and see how they were doing. They were doing a lot of what I learned in medical school, standard conventional medicine and then they were doing a bunch of other strange stuff. The number one prescription even in the 80s by German physicians was an herb called St. John’s Wort. They were routinely using acupuncture for pain and pain management. They had this little thing that I didn’t understand at all but was curious about called homeopathy that they regularly use. This really got me curious. I said, “These are pretty smart people.” They were trained scientifically and yet they seem to have a much bigger medical bag than I do. I have a lot of patients where I’d love to have some other tools if there were some good evidence behind them to use. I began to study with them. I began to learn. I began to investigate these areas and then gradually I began to import the things that I found valuable and if there were some research behind into my own practice. I put together what you would call an integrative practice way before the term was around. When I came back, it was a little bit more difficult. It was easier to do in Germany. There was a group and the apothecaries that supplied the herbs and remedies and things like that. It’s a little bit more difficult to get access here, but I realized that there needed to be two things. One, there needed to be more research in these areas. I was working at Walter Reed. I was running a research training program there and the Office of Alternative Medicine at the National Institutes of Health opened up. I said, “That would be interesting. Let me go over and see if I could help do that for a little bit.” I was detailed over there and I ran that office for about three and a half years. I helped to create a center, which it is now. That began to infuse the research into the area. After I got out of the government and retired from the military, I ran a research organization. I was interested in how do you truly integrate these things into mainstream practice. It was during that time that I realized that the vast majority of health actually comes from our behavior, not from a complementary medicine treatment, not from a conventional medicine treatment. That contributes some, but those are all assistance and the best way to use them is to assist people to become their own healers and to tap into their own inherent healing capacity. That really emerged out of the research. It was very clear. There’s data. I write in my book about that that I published, How Healing Works. It’s showing that. It’s very well-documented and well-accepted. Now, the focus is on integrative health. I want to define for your audiences the difference between integrative medicine, which is putting together a complimentary practice, non-mainstream and a mainstream practice, which is what I was doing in Germany and integrative health in which they are a key part of the team looking at the application of their own self-care to both prevent and treat their own illnesses. The difference between integrative medicine and integrative health and I focus on integrative health as part of my philanthropic activity for the Samueli Foundation. I think the concept of integrated health is something that’s new. We haven’t spoken about it on this show so much. You’ve spoken about integrative care and functional medicine, but you’re really giving people a different perspective and a different lens to look through, which is really important. In addition to your book, How Healing Works, I first came across some of your work in the Journal of Pain Medicine back in 2018. You conducted a study that is called Are Invasive Procedures Effective for Chronic Pain? A Systematic Review. As I look through this excellent paper, the question you asked in this article was, “Do invasive procedures work compared to sham procedures for the treatment of chronic pain and reducing pain, reducing medication use, preventing disability and enhancing health-related quality of life outcomes?” Why did you decide to tackle this really important topic? One of the things that we try to do is evidence-based medicine. What that means is you want to know if the treatment that you think is producing the effect is actually producing the effect or is it due to simply the fact that you’re doing a treatment of some type? You’re going through the ritual of therapy and that’s sometimes called the placebo effect. That’s embedded in every single therapy that exists, complimentary, traditional and conventional. You name it. It doesn’t matter. I spent a lot of time learning and also then ran research teams that did systematic evaluations of all kinds of therapies trying to determine, “Are things better than placebo? Are they better than each other using rigorous methods that are applied to all conventional medicine such as the Cochrane collaboration and National Academy of Medicine Guidelines?” We had done a lot of this with acupuncture to try to determine was acupuncture for pain better than placebo? We applied very rigorous methods to that and we provided several grants to good scientists to do that. That got us very interested in understanding this placebo process. How come when you look at a sham study, a lot of people in the placebo arm often get better? In fact, it’s sometimes very difficult to tell the difference between the active groups, the group you think is producing the effect. Whether it’s a drug or whether it’s a needle or whether it’s a knife and the ritual in which it’s delivered that have the expectations and this type of thing. When the chronic pain problems that we’re having in this country became so prominent and we began looking for non-drug approaches, non-opioid approaches, especially to pain management. I thought, we’ve looked at acupuncture, we’ve looked at some other mind-body practices and that type of thing, but what about surgical procedures? Those are very commonly used. Billions of dollars are spent for them for chronic pain problems. Do they actually work or is it the ritual of care? We did the systematic review to try to answer that question. How much of the specific surgical procedures and invasive procedures that are out there being used for chronic pain are actually resulting in the improvement in chronic pain compared to simply going through the ritual of getting a surgical light procedure? We have both practitioners and the public who reads. Maybe you could describe what a sham procedure is for everyone so they know what it is. If you have a placebo pill, if you’re doing a drug study, that’s pretty to understand. You have a pill that looks like your drug, but it doesn’t have the drug in it and people take it thinking it’s the drug. How do you do that with a surgical procedure? There have been ways developed to do that and they’re called sham procedures. For example, for back or knee pain. Several studies have been done and I summarized them and we analyzed the quality in the study you mentioned. We look at procedures in which the person got the regular procedure or they got a sham procedure in which they went through all the ritual of getting ready, getting draped, even anesthesia in some cases and all the informed consent. Then the surgeon would go in and they would maybe make a little nick on their knee or maybe just stick the needle in their back but not actually do the procedure, just withdraw it. The patients didn’t know if they got the real procedure or not. Now, obviously the surgeons knew if they had done it or not, but then the evaluators who came in and work to try to find out did this really helped with the pain and the function of the pain didn’t know which procedure they were on. This allows for those biases to be controlled to see, “Was it due to the ritual of getting a surgical procedure or was it due to the actual procedure that we do them for?” That was the purpose of doing that study. There are two things I’d like to ask you about. One is some of your background in acupuncture, which is interesting with regards to the placebo. I’m curious of your research and all this but I think the first question is, are you noticing that invasive procedures are increasingly becoming a treatment of choice for chronic pain? There’s all variety of types of invasive procedures. If you could cure a pain problem with a simple procedure, that’d be great. You didn’t need any medications after that. There is a growing interest in this. We’re developing new technologies that allow you to do those procedures in a much less invasive way. Back in the old days when we fused spines and opened up the back and put metal plates in and all that kind of stuff, that’s pretty invasive. It’s the same way with knees. You had to open up the knee and go in and clean it out. They now have little scopes, some small ones that can go through the little holes and they can manipulate tissues very well. They’re called laparoscopic approaches. Those things actually are in and out. You can do those on the same day. It’s not very invasive. Because of that, there’s a growing interest in using those things. The answer is, yes. For me, laparoscopic, it’s estimated there’s over $40 billion worth of those things done and the same thing with procedures for knee and back pain. They are growing because of the interest in non-pharmacological approaches. From the context of your research and the data you collected and analyzed, is there evidence to support the use of invasive procedures for chronic pain? Most surgical procedures have not been tested against placebo or sham because there’s some debate over whether it’s even ethical to do that. Can you do a fake surgery on somebody and should you actually be allowed to do that? There aren’t as many studies in these areas. There are drug tests which are easier to apply. We collected all the studies we found and then we took the ones in back and knee pain of which there were sufficient numbers for us to do what’s called a meta-analysis where we could combine the statistical average on what the results were in the two groups in a robust way. What we found is that overall, 87% of the chronic pain relief reported from invasive procedures for chronic pain was due to the ritual. That’s almost 90%. Over 85% is simply due to the fact that you would go in and you’d have something done because the sham procedures produced 80% of the pain relief. In some cases, they even produce better relief with less side effects than the full procedure. This is true in back and knee pain. If you look at the statistical difference between that, it’s not statistically different. In other words, it could very well be that the specific procedures actually aren’t doing anything and that it’s simply the therapeutic context and ritual and expectations and beliefs that are producing some pretty significant pain relief actually. It’s not that these don’t work, it’s just they don’t work for the reasons that the surgeons think they were. The vast majority of pain relief can occur if you engage in, believe in, and do the kinds of self-care and team with other people to help you get better. From a personal perspective as a practitioner, that number 85% that you unearth in that data is pretty remarkable. For example, if someone’s going for a meniscectomy in their knee because, “Either their knee is degenerating, they’ve osteoarthritis or they have a meniscal tear.” All those are at times indicated for an arthroscopic procedure of the knee that it’s not the actual trimming of the cartilage or repairing the cartilage. It may not be anything past the skin that the physician is doing that is causing pain relief. We’re talking talk about the brain a lot on this topic and the influence of the brain on pain. I’m excited about this research because I’m a physical therapist and it helps point people in our direction as far as, “You might not need surgery to have pain relief.” My question for you as a physician, what is the response been from your colleagues in orthopedic surgery or anesthesiology with regard to the data you collected? First, let me say that the value of this study is not to show that surgery doesn’t work. We wanted to know that. It’s obviously one of the questions we were asking, how much evidence is there that actually works and how rigorous is that evidence? The value of the study I think is to show how powerful our inherent healing capacity is. A vast majority of pain relief can occur if you engage in, believe in and do the kinds of self-care and team with other people to help you get better. That to me is the most important thing. If we isolate and identify what those factors are and that’s what I try to write about in my book, then you can enhance and access those kinds of healing capacities with less side effects and with less dependency on the medical system. That to me the most valuable thing in there. Your question was what has been their response? Largely, it’s been silence. I think the surgical world is not quite sure what to do with this information. This has not been the first time people have questioned the value of surgery as it’s currently done for chronic pain. There has been a debate within the surgical literature about this. For example, when some of the first studies of knee arthritis showed that people in the sham surgery group had pain relief just as much as in the real surgery group for over two years afterwards, those procedures began to go down. People started to use less and less of them. They began to be more selective in terms of who they were doing them for, trying to make sure that they had an anatomical problem that they were correcting, which is what surgery attempts to do in those areas. There was some adjustment in that. I think in the back area, it’s such a big problem. It’s such a lucrative field. There’s such a big industry on it. There’s still yet to be a full debate about what should we do about this. Should we continue to do sham studies to try to understand this area? Should we come out with less invasive procedures that have less side effects because we may be able to get? Should we do other therapies first before we engage in those kinds of things? That debate still has to emerge and my hope is that this study will contribute to that discussion. It makes us all reflect because I’ve noticed since the opioid epidemic has hit that there are many different types of practitioners that are saying, “Let’s try this. Let’s try that.” Different courses are popping up, different types of medical facilities are popping up and one of those I’ve seen that starts to increase a little bit is minimally invasive procedures. If an opioid isn’t the way, let’s try a minimally invasive procedure. It sounds high tech, which can be very attractive to someone with pain. Although your research is opening our eyes to say, “Let’s really see exactly what is happening here.” Like I said, I think people in the mental health professions, behavioral medicine and physical medicine may be quite excited about this research. If your audiences are interested in this whole phenomenon of what is underneath this term placebo effect. We use it and throw it around for things. What are the underlying mechanisms? I think we should get rid of the term placebo effect and talk about how do we look at the healing response. Dan Moerman and I wrote an editorial in the Annals of Internal Medicine suggesting we get rid of that term and call it the meaning response. I think the healing response would be even better. There is a society that studies this. If your audiences are curious about it, it’s called the Society of Interdisciplinary Pain Studies, SIPS. We help co-found it. They have a conference every couple of years and it’s the researchers who are digging in to try to understand what’s happening in the brain. What’s happening in the culture and what’s happening in our own bodies when this inherent healing response is activated? They’re important topics because a paper like this could even have implications for third-party payers when it comes time to reimbursing for a certain procedure, which could change the landscape of certain healthcare institutions that have put a lot of money in toward orthopedics or other minimally invasive procedures and centers and things like that. Many of these procedures are already paid for, yet things like acupuncture are not paid for. We use the same kind of methods to look at whether acupuncture is a placebo or not. We’ve done that and other people have done that. Actually, for chronic pain, acupuncture works better than placebo. There’s more evidence now that acupuncture works for chronic pain than there is for surgery and yet, acupuncture is not paid for, but the surgery is. We need an adjustment and truly apply evidence-based reimbursement. Behavior is a lifestyle. It’s what you do, how you sleep, what stress you’re going through, what you’re eating, and how you’re exercising. There are a lot of things. There’s meta-analysis on nutrition, there are multiple different types of analysis on pain science education and on movement. There are a lot of things that personally, I think it would be good if we start to shift some of the funds so people could get the help that they need from practitioners. If we were to reimburse based on good scientific evidence, evidence-based reimbursement, we would get better outcomes and we’d be able to lower costs. In your book, you talked about how healing works. You say that only about 20% of healing comes from a doctor’s office. It’s not coming from the physician, people think, “If something is problematic with my health, I go to the doctor.” If it’s not coming from you and your office, where is it coming from? That’s exactly what I try to answer in the book. There’s a lot of data showing this. Many groups like the National Academy of Medicine and Robert Wood Johnson Foundation, various university studies, CDC have looked at this. They’ve shown that if everybody were to suddenly get Universal Health Insurance and have full access to current medical practices, it would improve the population’s health only by about 15% to 20%. The reason for that is that the only that much actually comes from medical interventions and healthcare, the healthcare system itself. The rest comes from three other sources. One is behavior, it’s a lifestyle. It’s what you do, how you sleep, what stress you’re going through, what you’re eating and how you are exercising. It is also the social environment. The emotional components, whether you’re lonely, whether you have social support, whether you’re addressing things that are meaningful for you and your life. The other group comes from what’s called the social determinants of illnesses. These are really the things that allow you to engage in the behaviors or interfere with your ability to engage in the behaviors. They have to do with poverty and education and a lack of access to healthy food and a lack of access to transportation and housing and those types of things. Each of those components contributes about 30% to 40% to actual health outcomes in the population. There’s a big movement now to say, “If the healthcare system is going to be producing health, they need to get out of that 10% to 20% box only and begin to address the behavioral components, lifestyle and the social components that are the enablers around actual health within the population.” Countries that have done this around the world have shown improved health and they’ve shown lowered costs, especially compared to the US whose costs are going through the roof and whose health outcomes are declining. I know there are studies like that, especially in some of the Nordic nations who’ve put some money in those areas and they do have better outcomes and people actually get better and their health improves. Integrative health and whole person primary care I think is the thing that they have done that has really shown the impact by getting at these underlying determinants of health and shifting those. Your audience can do this. They don’t have to wait until a whole system does this. The rest of my book is on how do you do this? How do you do it in your life? Have you done it with your current doctor and your current healthcare system itself? My audiences are actually are picking up the message because I get emails all the time and people say, “By reading your blogs, I was able to change my diet” or “I now feel like I can go to the gym” or “I was able to find a provider to help me.” Along those lines, you mentioned two things, one was education and the other was access. If you had to hone in on one to put your money behind, which one would it be? Access is key. I think the evidence is there as to what needs to be done to access that inherent capacity that we were just talking about. To do that along with your healthcare system, we need to have systems that deliver what I call integrative health. Integrative health is this combination of conventional care, evidence-based complementary medicine like acupuncture, that we talked about and self-care, behavioral components. You can begin to do this. There are providers that are starting to do this. Ask people to do an integrative health visit. If the providers don’t know what that is, all you got to do is go to my website and I have a step by step set of instructions on how to do it. You can do it through a series of steps called the personal health inventory, the healing oriented practices and environments note, I call it the Hope Note and developing a personalized health plan. It’s possible to map out a personalized health plan to put together a team, including your provider to do that. Your provider can actually get reimbursed in that. I have instructions on how they can use the standard reimbursement codes to actually begin to do that. The first thing would be to ask, I want to do an integrative health visit. Will you do a Hope Note with me? Then you can begin to develop your own personalized health plan in parallel with that. Identifying what matters to you is one of the greatest drivers towards healing. Everyone can go to the website, www.DrWayneJonas.com and you’ll find the forms that Dr. Jonas was talking about. From the patient perspective, how do they seek a provider such as yourself that has a forward-thinking view on integrative care and health? I have a guide on that on my website also. There are increasing numbers of educational and training programs that are providing training to doctors so that you can identify, access and partner with doctors like that. There is a board certification, the American Integrative and Holistic Medical Board. Doctors can go get the training on that. They can get board-certified. Those are folks that actually have this philosophy. There’s The Institute for Functional Medicine, which focuses a lot on nutrition and trains doctors on how to use nutrition, behavior and lifestyle in the integration. They have a certification process on that. That’s another approach in those areas. There’s Institute of Lifestyle Medicine, which does the same types of things specifically in lifestyle. The Samueli Foundation, has just provided a grant to medical and healthcare universities, healthcare science centers, specifically the University of California in Irvine. It is one of the state universities in Southern California to transform their entire educational program so that their doctors, their nurses, their pharmacologists and their public health specialists all come out trained in this philosophy and with these skills that can do that. We’re hoping others will follow that lead. There are smaller efforts around the country through the Consortium of Integrative Medicine. It’s a group of 70 academic centers around the country educating people in these areas. It’s beginning to become a standard part of health and medical practice. I know you have some personal experience with your wife’s illness that has made this personal for you and has made the mission stronger for you. Can you share that story with us? When I was writing my book, How Healing Works, right in the middle of it, we had a grandchild. My wife helping to take care of the grandchild and she was holding the baby up against her left breast and she noticed something funny there. She’d have all her screening tests and they’d all been normal, but she noticed something funny. She went in and it turns out she had an early breast cancer. Now, it wasn’t the first time. She’d had breast cancer 26 years ago and had been fine ever since then. This was a different type of breast cancer. We were going through the process of how do you manage that with an oncology system that primarily is there to kill cancer and then they just hope you do well after that. All the stuff that I had been learning and I had brought into my practice around how to enhance your own healing capacity and how do you put that together. How do you put it together in a way that it doesn’t interfere with your life? What she taught me out of that was that creating a social support network, a team of friends and family around your care to help support you through the emotional component was one of the key aspects of how healing happens. That’s actually one of the four dimensions that I write about in my book that is a core pathway to healing. It’s the social and emotional dimension. She identified what was most important to her in her life. What matters, not what’s the matter. What she wanted to get out of and made sure she aligned both her therapy and her life in a way so that no matter what the quantity of life, the quality of life was what she wanted. I think that is key. It’s not a playoff between the quality and quantity of life. In fact, identifying what matters to you, the spiritual and the mental component is one of the greatest drivers towards healing that you can have in all the other dimensions. It’s the first question that I asked my patients when they come into practice, “What matters to you?” That’s where we start in our integrative health visit. It sounds like a really good values-based perspective that you’re working towards. Obviously, that life experience for you helps paint a picture of personalized and patient-centered medicine which is hopefully the direction that we’re all going in the world. Whether it’s pain care or other types of chronic disease. You mentioned one dimension though. You said there are three other dimensions in your book. Can you mention what they are? The four dimensions that I recommend that I put into an integrative health visit and that I embed into the Hope Note and that I teach residents how to do are four. One is this mind and spirit component. What matters to you in your life? What’s important to you? That’s number one. The second is the social and emotional parts of your life. I ask everybody if they have social support. Who are the people that they live with? One is why are you living? Two is who you’re living with and are they providing you with the kind of support that’s needed? Three is the how and that’s the lifestyle components. That’s the third dimension, the behavioral components. That’s the sleep, nutrition and exercise. The fourth is where? What is the physical environment in which you live? My wife taught me about this too, when she was going through it. She realized that her bedroom was not a relaxing place. After she got some of the very harsh treatments, the surgery and chemo and other things, she needed a place where she could really rest and heal. She decided to change the whole bedroom to make it a peaceful place, to get the clutter off the walls, to make sure the light was natural light. That it was warm and comfortable. Some of her favorite art was on the wall. That there was space for our grandchild to come and play and be with her. She redid the physical environment. Those are the four things I ask. The mental and spiritual, the social and emotional, the behavioral lifestyle component and then the physical environment. I have a guide on how to do that on my website and also in the book. I love those four dimensions. I think they encompass a lot of the lessons that we teach on the show that people have picked up over the course of a hundred and something episodes now. Dr. Jonas, I think your work is great. Thank you for joining us and enlightening us with some of the information you have and your book, How Healing Works. Everyone can find it on your website at DrWayneJonas.com. Can you tell us where else people can find you? What else you’re up to and what other exciting things you have going on? We regularly go around the country looking for examples of what should the new kind of integrative health care look like. We put those onto the podcast. I do a video question and answer and an interview. If you have questions that you’re interested in in those areas, send them into the website. My email is on that and we’ll try to answer it. We’ll try to do that. I also have a summary of some of the most interesting research on healing that comes out from around the world. I try to do simple some summaries so that you can find out the latest things that are going on in these four dimensions that I occurred. I think the most important thing for your audiences though, is to get empowered themselves. I have a guide on the website that you can go through that has a simple set of questions that can help you map out your own healing journey. I encourage you to go in and talk to your healthcare provider, be it a primary care doctor or nurse practitioner, whoever you have your primary care with and say, “I want you to do a Hope Note. I want you to do an integrative health visit and here’s how to do that.” Because the healthcare system changes when the public demands it. The whole area of complementary medicine, which is becoming more and more prominent started because the public said we need this, we want this and that got the professional and the research side to get involved. It’s your audience who are actually going to do the healthcare reform that perhaps our politicians won’t do and they can do it now in their own lives. I encourage them to do that. At the end of the day, it’s what the consumer or what the patient wants. It’s not necessarily what we want as practitioners or what the research even says. We have a term for that in medicine, it’s called patient-centered. We’re supposed to be doing it anyway, ask for it. I want to thank Dr. Jonas for being on the show. Thank you for joining us. Take this blog and drop it in your favorite Facebook group where they may be interested in integrative or lifestyle medicine or chronic or other types of disease. Make sure to share it out with your friends and family on Facebook, on LinkedIn or Twitter. It’s a wonderful episode and make sure to check out Dr. Jonas’s website. I want to thank all of you for being here and we’ll see you on our next episode.